When I was a child, and daddy opened my first savings account for me, he impressed upon me the importance of not keeping all my money in one place. Because of this advice, which came straight out of the Depression Era, I’ve always maintained two independent banking relationships. I normally have a checking and savings account in each bank. I’ve done it this way for 40 years now. That all being said, the day when a bank offered you services gratis is pretty much over with, unless you maintain a relatively large hoard permanently on their books (minimum monthly balance). I rarely have enough money to maintain a hoard like that, so banks begin to service charge me to death. Once a bank that I’m dealing with begins the ol’ service charge BS, I’m gone. Thanks to the new greed trend in banking (or maybe it’s not so new), I’ve had to change banks numerous times in the past 10 years… very annoying. Each time a bank notifies me that they are going to start taxing me to use their services, I immediately remove my hoard from their control and place it in other less greedy hands. Unfortunately, banking facilities that do not charge service fees are becoming very rare of late. I’m at the last frontier of free banking services right now, I believe… credit unions. Most credit unions are not-for-profit operations, so greed usually doesn’t raise its ugly head, to use a cliché here. About a year ago, I had to remove my hoards from Wells Fargo and 5/3 Bank nearly simultaneously, as they began charging ridiculous service fees after promising me in writing that my free accounts would always be free. HA! All told, my accounts combined totaled about $47.63, but it was MY HOARD, DAMMIT! And I wasn’t going to let those greedy bastards continue to deplete it. At that time, I found a nice credit union and a small neighborhood bank to safely tuck my money away in. Unfortunately, the small bank failed and was given to a larger banking organization by the FDIC. The larger bank has now decided to tax my hoard at $10 a month! They can piss off. 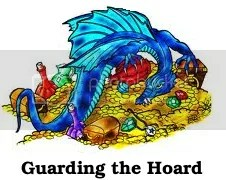 I’m taking my hoard out of there today because I found another nice credit union to join. After today, my hoards will be safely stashed away in two institutions; one a state credit union, and the other a federal credit union. Oh boy! My hoards, which are currently valued at approximately $112.81, will be safe and free from the fat bankers and their fees-for-service. Service? HA! What a joke. I can’t even get a live human being on the phone at most of these larger banking operations. Well, gotta’ run… I want to go transfer my hoard before those greedy bastards charge me another fee of some sort. Posted by V. T. Eric Layton on 28 March 2013 in Whatnots and tagged banking, credit union, greed, hoard, service fees. Just do like I do and buy a safe for your closet. Much easier to manage your money and the banks cannot get any of it. Use a Walmart money card and load the funds when you need to pay a bill. I have been doing that for years.